In recognition of our work to help solve the challenge of the SS Richard Montgomery, Frazer-Nash has been awarded The Institution of Engineering and Technology's Innovation in Safety Award - presented as part of the first ever ESAS Safety and Environmental Management Awards. The ship was wrecked off the Nore sandbank in the Thames Estuary, near Sheerness in 1944 with 1,400 tonnes of munitions on board. It continues to pose a considerable threat and the longer it remains in place the more difficult it is to quantify the risk and to assess a suitable wreck management strategy. Frazer-Nash, in conjunction with Dstl, assembled and led a Munitions Working Group (MWG) with representation from across industry and academia to investigate the problem. The Innovation in Safety Award recognises the group's achievement in overcoming a significant safety engineering challenge through the development and application of a novel and innovative approach. 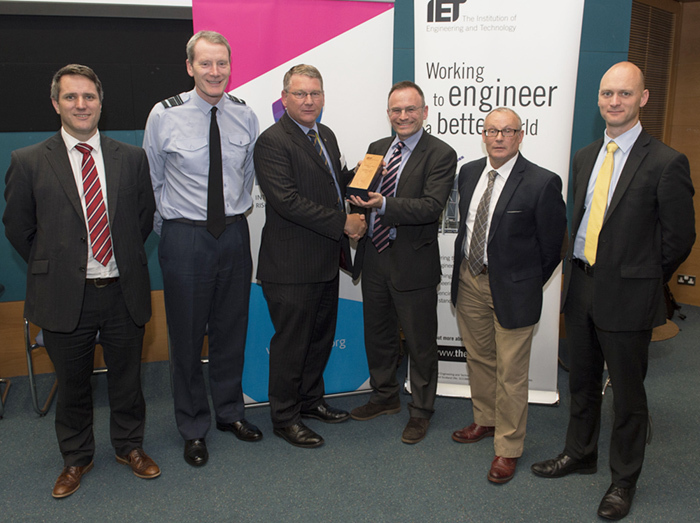 Air Marshall Young and Brian Penfold (Deputy Chair of the IET Functional Safety Group) presented the award to Frazer-Nash's Charles Brooking, David Wyse and Rob Leary alongside Richard Briers (Dstl) at the MOD's Environment & Safety Assurance Symposium (ESAS) at Abbey Wood. With our work starting in early 2015, the project involved our skills and people from Safety, Modelling and Technology Management.